Speculation on what linkage is used in the Bicycle Fabrications Candyman? Discussion in 'Downhill & Freeride' started by toowacky, Jun 11, 2012. The linkage is covered up as it was when it was shown at NAHBS, per pending patents. So what do you think is underneath? Perhaps something like the Corsair dual short links? 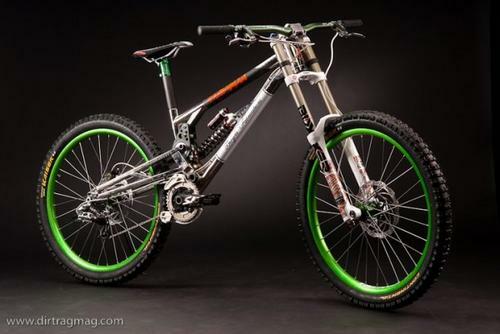 Or something similar to the prototype above, which in a way reminds me of the Yeti SB-66 pivot? I feel stupid. Usually I know what a linkage does but I'm very confused on the advantages here. Changing the shock rate I guess. It wouldn't have any effect on wheel path. Rising rate, and laterally stiff. Im guessing it doesnt weigh as much as it looks. Thin section bearings arent too heavy, and Im sure that aluminum bit in the middle is turned out pretty thin. I bet its stiff. I dig it. It's still heavier and more complicated than a smaller simpler linkage. That's why I'm curious what it achieves over regular linkage. I'm really not a fan of complicated for the sake of complicated. Hell I understand Knolly but here? I get what you're saying on the weight thing. It really isnt a complicated linkage though, its quite simple really. Its just one link with 2 extra bearings, and a floating mount, that creates a different leverage ratio as it cycles. I can name about 10 bikes off the top of my head that have much more complicated linkages. The case is not if a bike has a more complicated linkage but if it achieves anything with it. To be honest I find the dual shock bikes from NZ having more purpose in extra complication than this one. Not to mention I never understood some companies obsession with shock rate. I always believed control over axle path is much more important and is more noticeable on the bike. Shock rate is usually just preference and I don't see how anyone can come up with anything new (and useful) in that department. But, Bigger bearings = LESS shimz? if the patent is pending, why does he have to worry about someone stealing his idea? If there was another pivot ala yeti switch (so one having an influence on the axle path too) I'd be more interested and curious. Even though at 4.30 am I have no idea how it can work. Eccentric pivot within the swing-link. Doubtful the "race bike" has the same arrangement based on the pics, but possibly an eccentric in the taped-up area, but that'd be a pretty radical departure from the original. i'm of the opinion that the age of bike suspension patents is coming to an end. now you need an acronym, a TM and something that doesn't look like a catalog bike. oh yeah, and maybe make sure it rides ok and has a decent shock tune. to get a new suspension patent these days, you're gonna wait for friggin years. I've got stuff in from 2005 still trucking through the "system". It gets so sliced and diced to rack up fees for the USPTO, their only way to generate revenue. So, design something novel, and while you're waiting for the patent to clear, somebody else can make it, sell it for a few years, and then move onto something else before you even get the patent. Its like you get sloppy seconds on your thing, which makes you wonder if its even worth commercializing it at that point. SCB has a decent patent on using a floating shock on a single pivots, but after the cannondale moto and evil revolt, it doesn't seem like a place to go for a while. i'm interested in hearing if anybody cares about "patented" suspension anymore. seems like a lot of bikes are pretty good nowadays if someone is paying attention. I have a patent for something completly original,yet the above statements are true.I was naive in thinking that the patent office was somehow,there for the betterment of society as a whole(I know,Iknow ).The thing exists to grow itself and collect as many fees as possible(Because you have the greatest idea ever and if you let it go by not paying the extortion fees,you'll never get a patent ..or worse,because it's applied for ,people can see it and they'll take it from you and patent it them selves)Bitter much? nope. when i see patents on things like this, i immediately think "so this is how mediocre lawyers stay employed"